Victoria and Sam’s September wedding was held at Manor Mews in Norfolk. 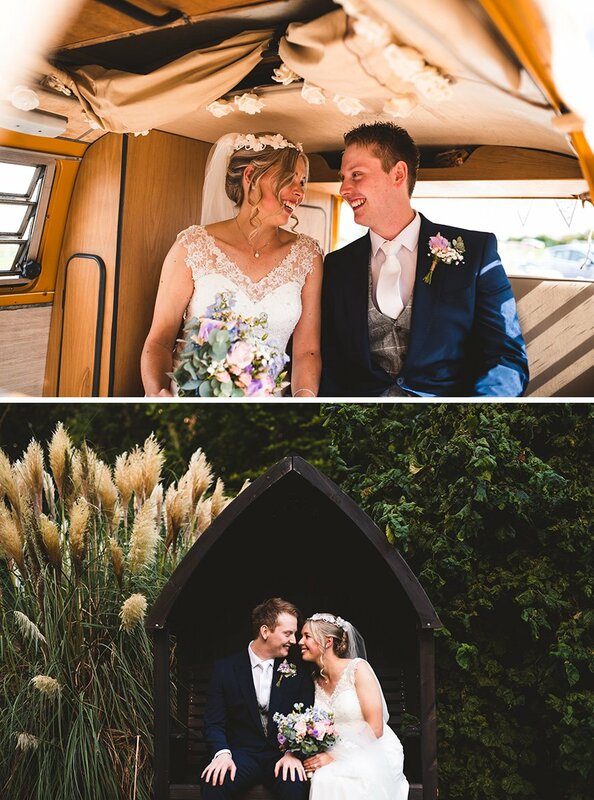 With a beautiful pastel colour scheme and just a hint of Disney, love was in the air! On the lookout for a Norfolk wedding venue, Victoria and Sam fell in love with Manor Mews as soon as they set foot through the door. “It was a beautiful barn and perfect for what we wanted,” smiles Victoria. Setting a September date, the happy couple chose a pastel colour palette with a subtle Disney theme. Disney table names featured alongside candles and fairy lights. Victoria and Sam made most of the decorations themselves, from a beautiful arch with fabric and artificial flowers to tea cup favours filled with tea, coffee and biscuits. When it came to flowers, beautiful roses sat on the tables alongside other floral arrangements and olive trees sat at either side of the aisle. After trying on a number of dresses, Victoria found her dream gown in ‘Brides of Norfolk’ in Fakenham. Slim fitting with detail at the top and a beautiful train, she loved it as soon as she tried it on. The beautiful bride accessorised with ivory shoes, a pearl necklace and earrings and a head piece worn by her mother on her wedding day. As for the groom... Sam hired his suit from Slaters, choosing a navy design and tweed waistcoat. The groomsmen wore the same with different waistcoats and ties. Accompanying her down the aisle, Victoria had four bridesmaids. Her two adult maids wore knee-length dresses in green and blue while the flower girls looked adorable in pink and purple. “The bridesmaids had the same shoes as me but in silver glitter!” smiles Victoria. Following their ceremony at Manor Mews, guests enjoyed a drinks reception before moving in to dine. Roast chicken was served, followed by a delicious passion fruit cheesecake. As the sun went down, Victoria and Sam danced their first dance to ‘Chasing Cars’ by Snow Patrol. Chip cones and bacon sandwiches proved a popular choice for evening food and the newlyweds, along with their guests, danced the night away! If you want to find out more about this beautiful barn wedding venue in Norfolk, head on over to the Manor Mews listing page.